Bubby and Bean ::: Living Creatively: winter wedding mad dress dash! winter wedding mad dress dash! Tomorrow evening, a dear friend of mine is getting married in what will undoubtedly be an absolutely lovely winter wedding. 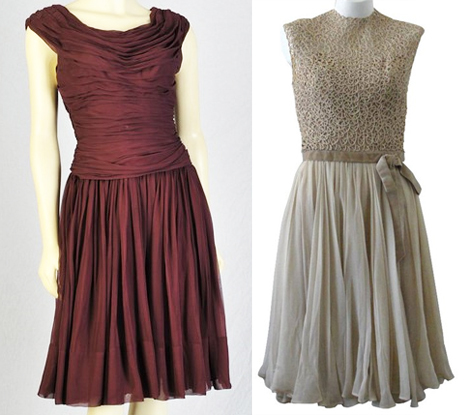 When I have a wedding to attend, I usually either design something or pick up a vintage or thrifted dress that I alter. Between the craziness of holiday orders, Christmas shopping, and preparing to leave to spend a few days in Austin with the boyfriend's family, I haven't had the time to do either of these things, and now have approximately 22 hours to pull something together. Plan A is to run out (in a few minutes, literally), and see what I can come up with. Plan B will be to ravage through my closet, which unfortunately currently contains only a couple of pieces that would be appropriate, both of which I've worn recently to other events. 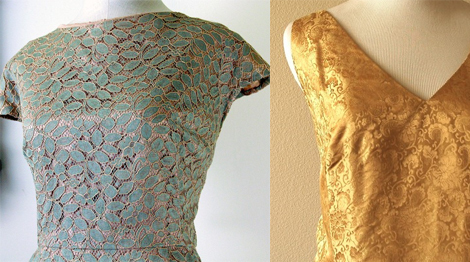 I decided to quickly browse Etsy for some vintage dress inspiration to motivate me to find something beautiful, fast. Enjoy these pretty party dresses (which are just too beautiful not to share, and affordable!) as I brave the cold for my mad dress dash. I'll let you know what I find! OOOOooo, I love the one on the top left!!! Good luck on your dress dash! I hope you found something pretty!